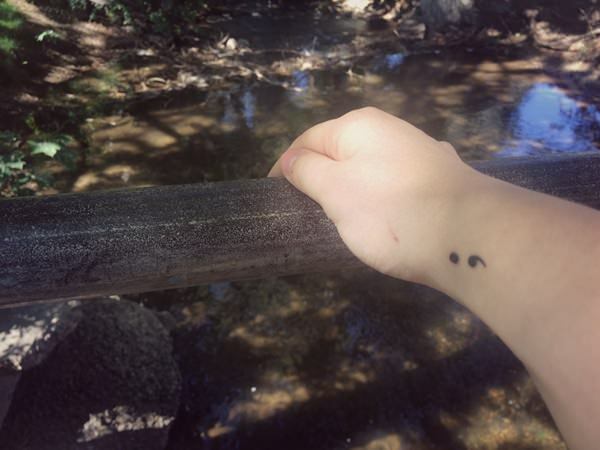 The semicolon tattoo has steadily grown in popularity thanks to its association with hope. 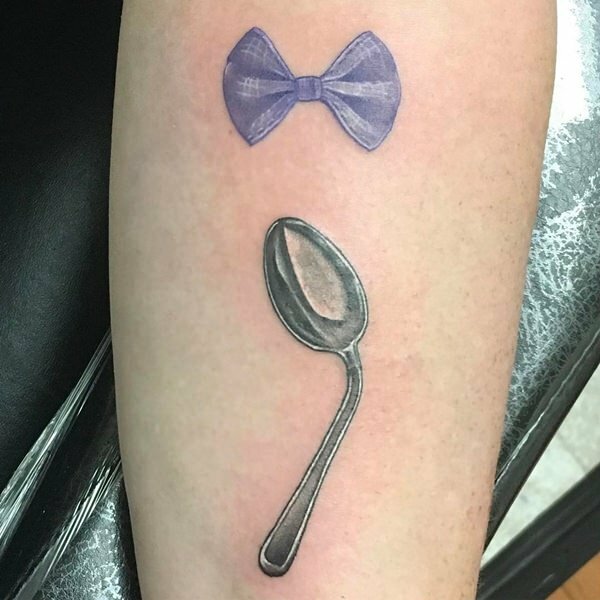 While before, people might simply have imagined those with such tattoos to be grammar or language geeks, there is far more to the image’s meaning these days. 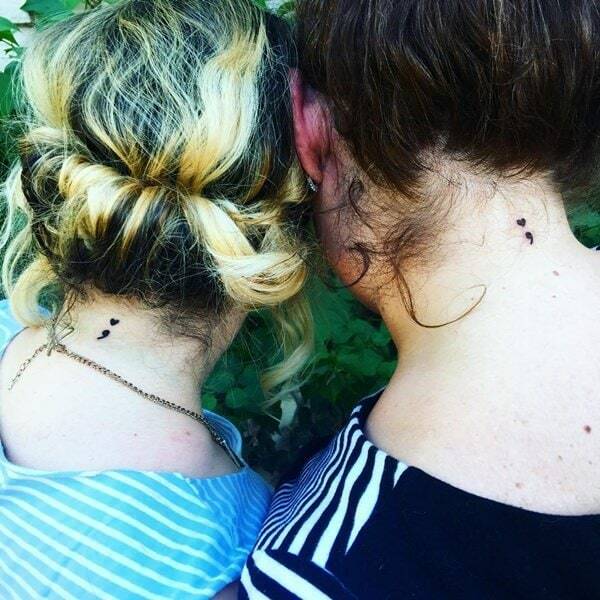 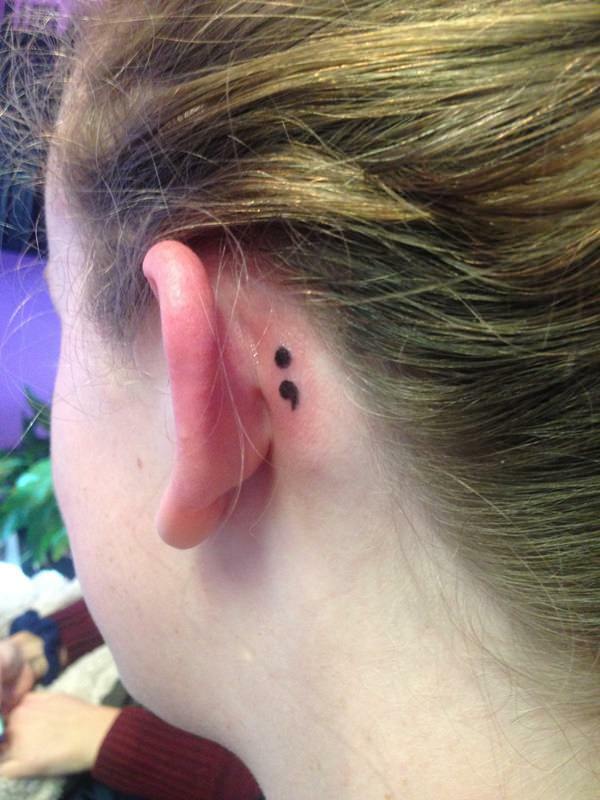 Today, the semicolon has come to symbolize optimism, survival, and support. 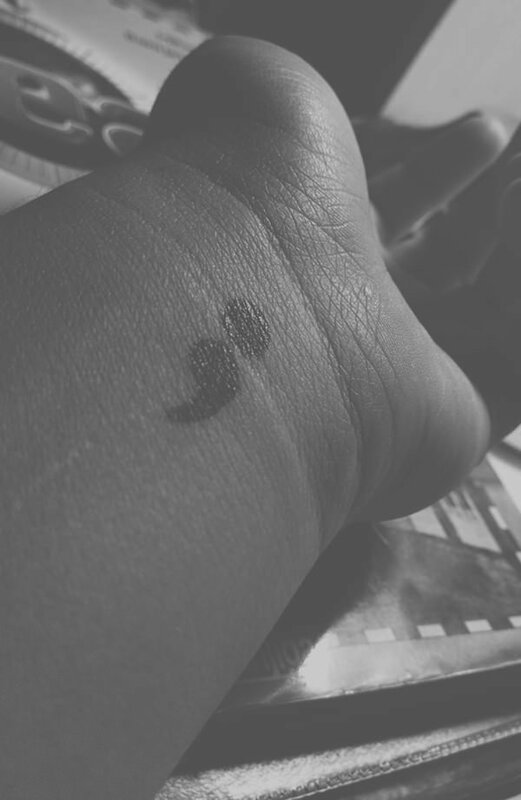 With such associations, it is no wonder that more people are getting interested in this punctuation mark. 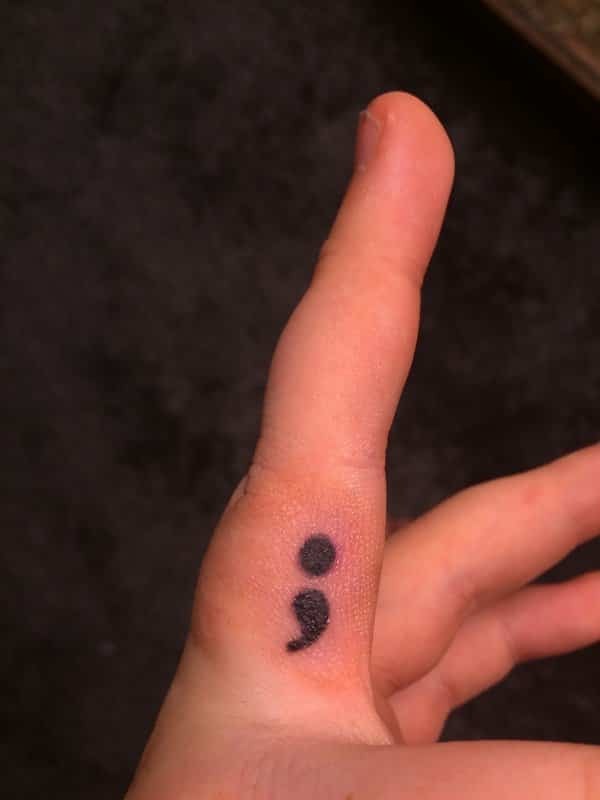 There are many kinds of semicolon tattoo. 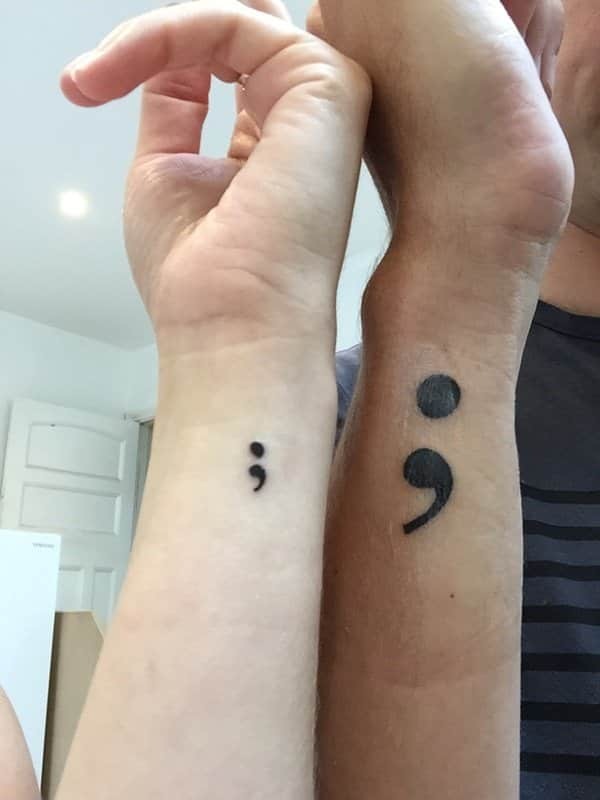 For our purposes, we can separate them into just two main types here. 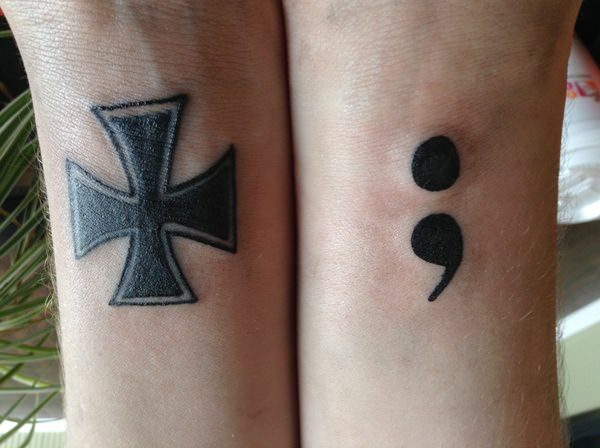 These would be the simple semicolon tattoo and the embellished semicolon tattoo. 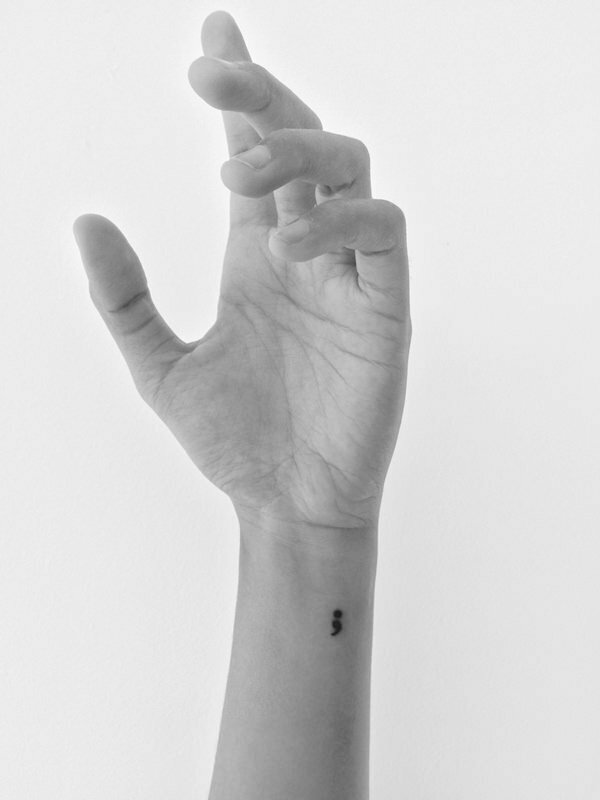 The simple semicolon design is just what the name says: a semicolon. 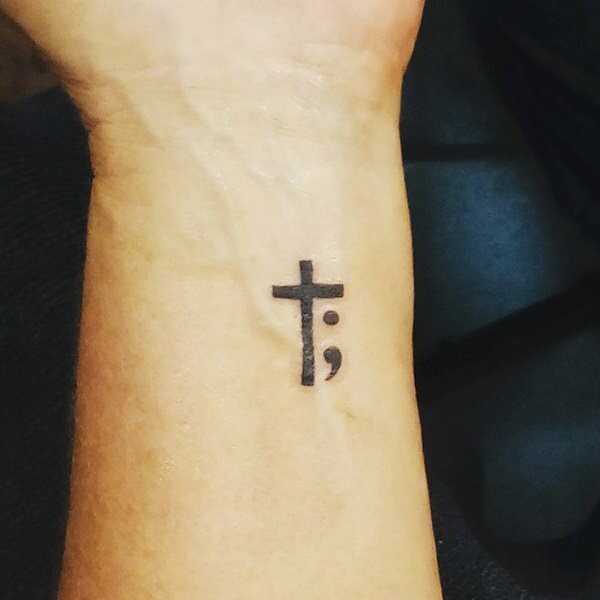 This is not for everyone, as some may find it a touch devoid of ornamentation. 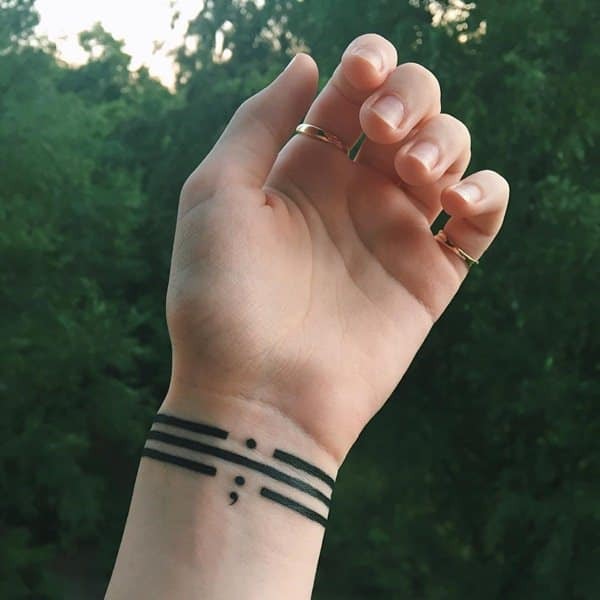 Those who do get tattoos with this design, however, are usually well satisfied with the simple strength of the solitary mark. 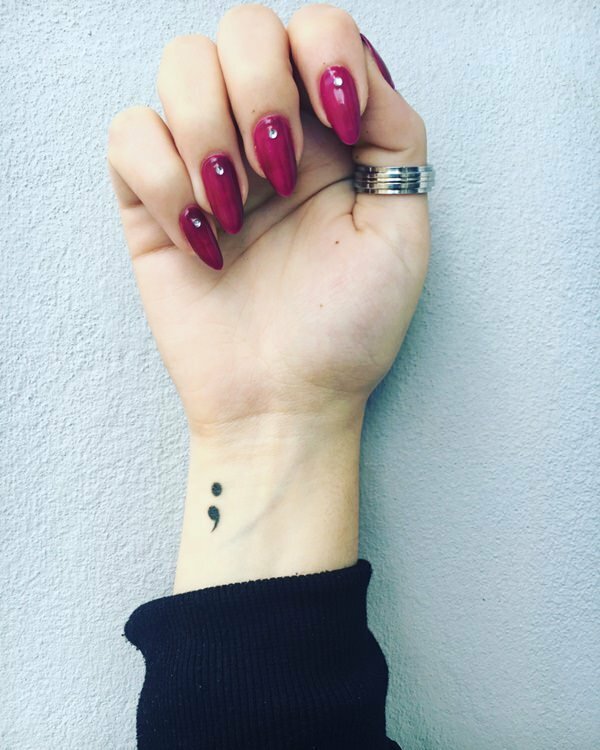 They want all attention—when attention is given, solicited, anyway—upon the symbol itself. 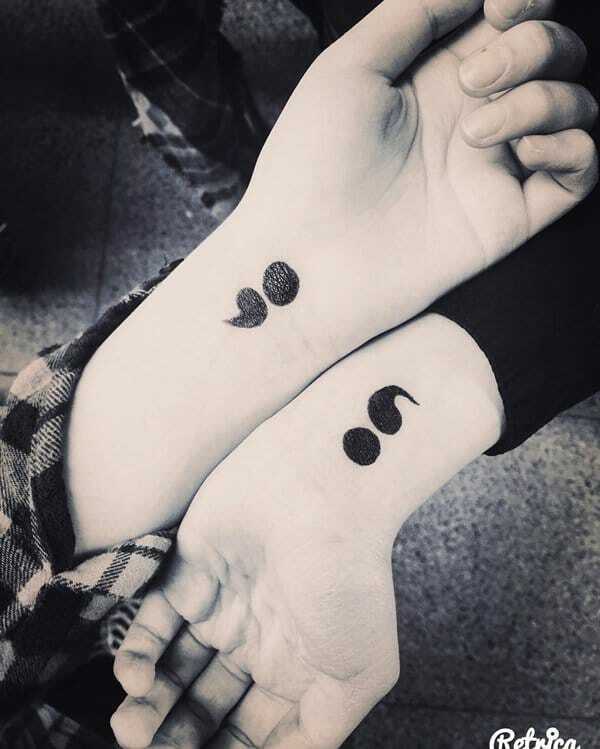 Embellishment gives way to stark emphasis and the semicolon becomes almost akin to the exclamation mark, in a way. 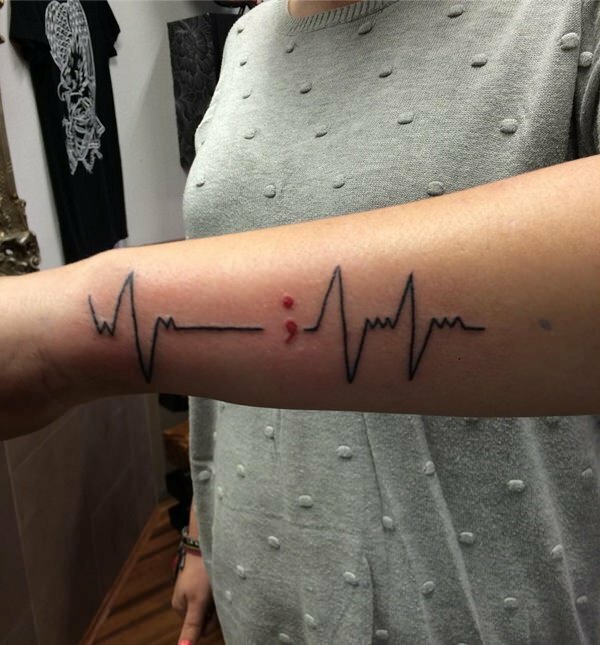 It draws attention to its signification alone. 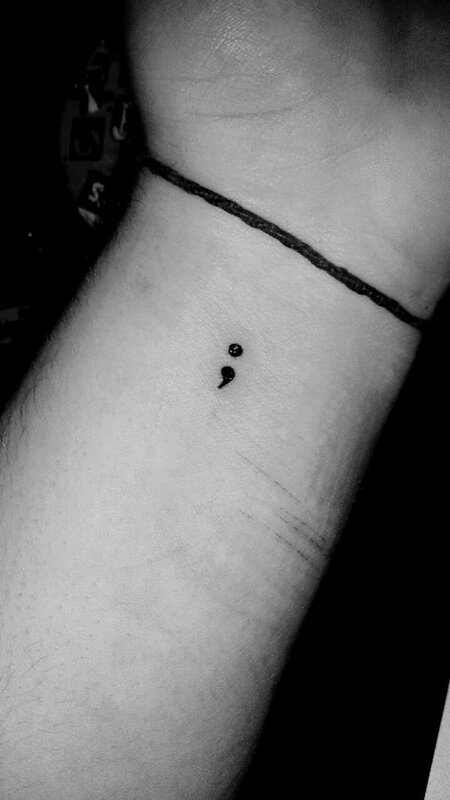 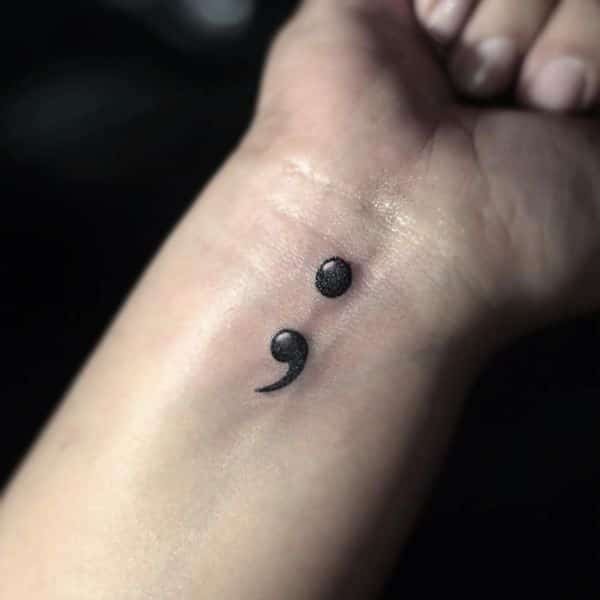 This can be a good choice if you want a semicolon tattoo in order to show solidarity with those who hold to its message of hope and continuance, but do not want something too showy for that. 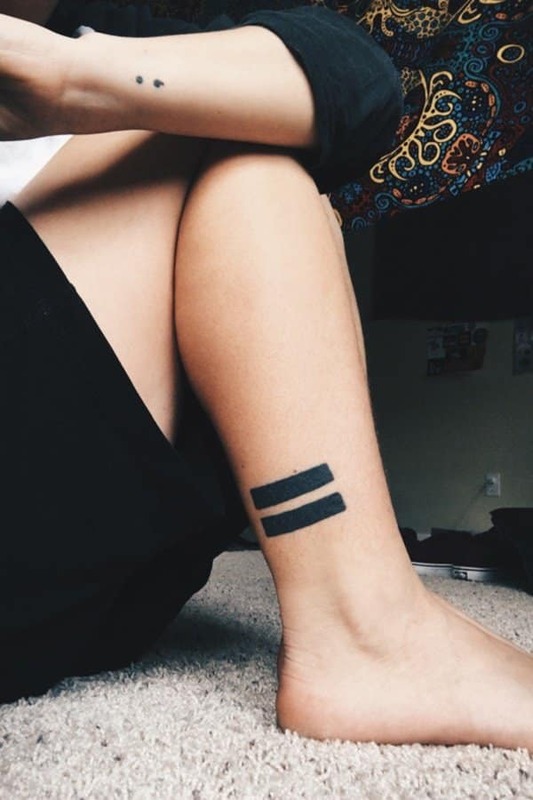 It can be a good choice too if you are simply the sort of person who prefers to be discreet or simple when stating allegiance or affiliation. 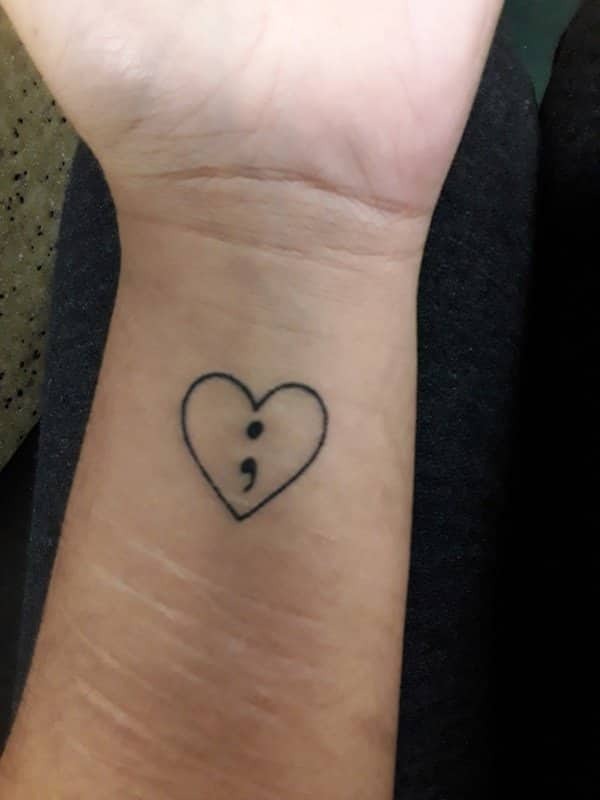 The simple semicolon can be done in just about any color ink, though, so you can actually choose a bright color to add extra “oomph” to the mark. 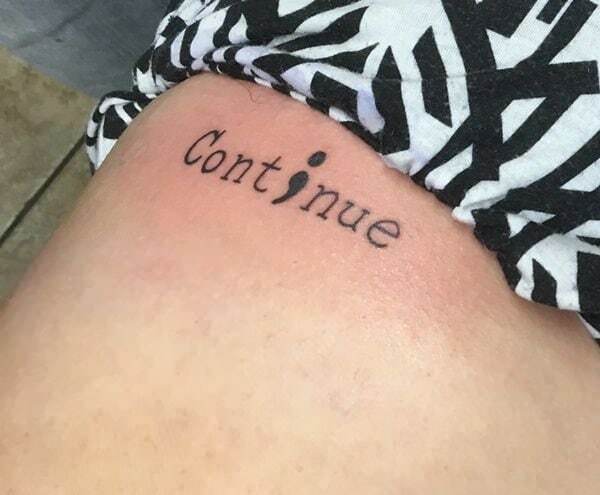 These are growing more common these days. 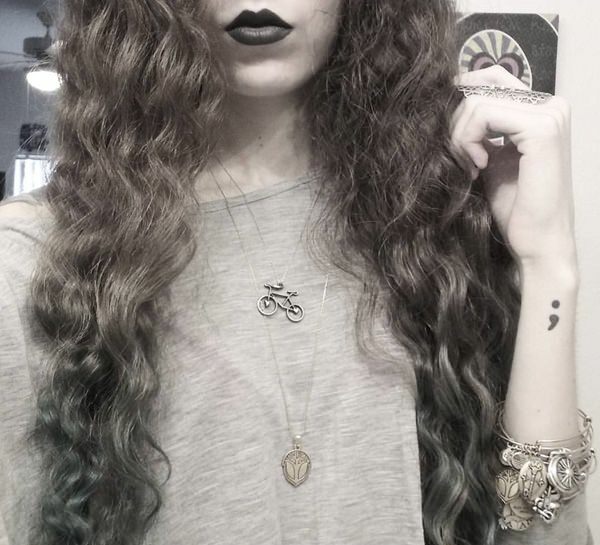 Ornamented semicolon tattoos can be found in several shapes and styles. 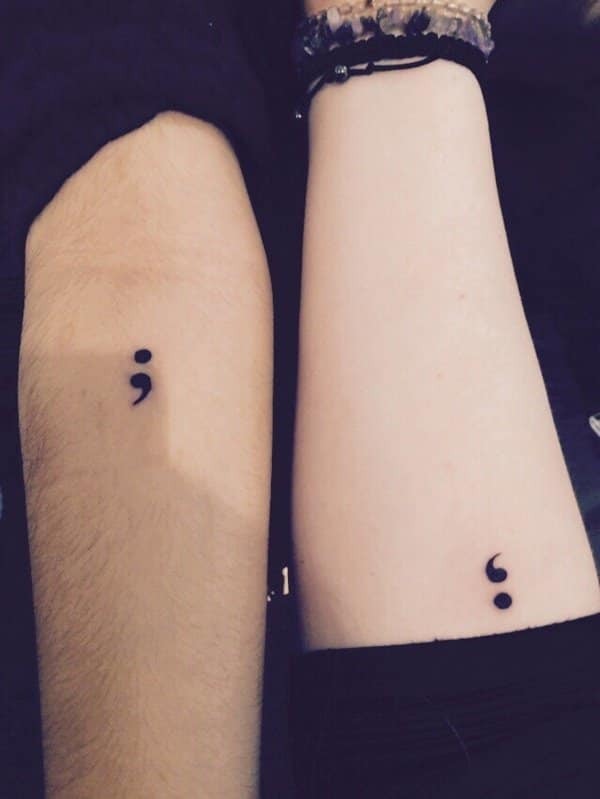 All they have in common is the semicolon featuring prominently in the design. 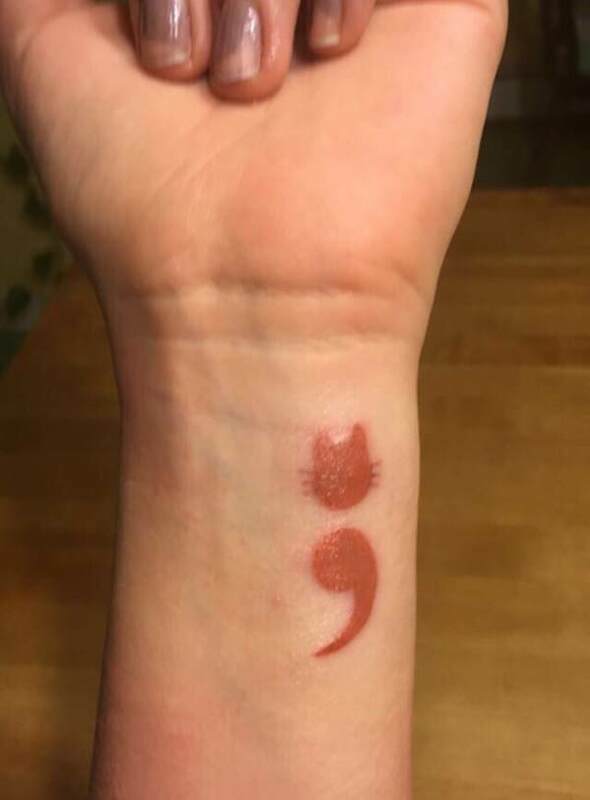 The semicolon can then be incorporated into any number of embellishments or art pieces: people often use it to represent the body of a butterfly, for instance, and ornament the design through the butterfly’s wings. 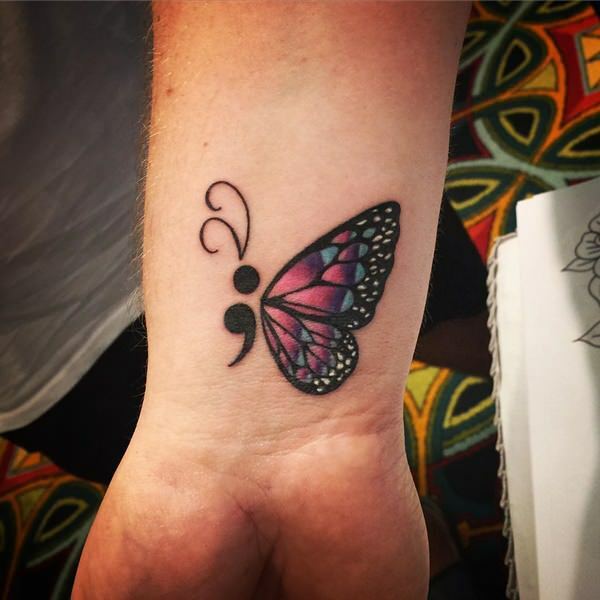 Ornamented semicolon designs can also be done by simply creating the outline of a semicolon, then using colors or art to fill in the spaces within the lines. 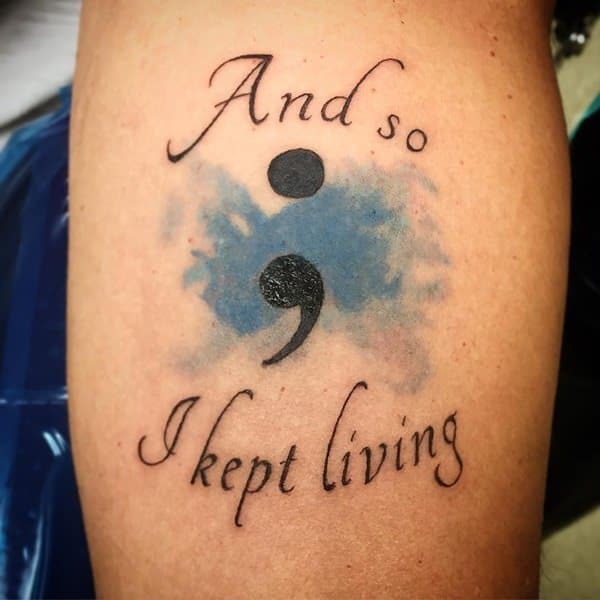 Just about anything goes with this type of semicolon tattoo, so do not be surprised to find some very colorful or eye-catching examples once you start to look around. 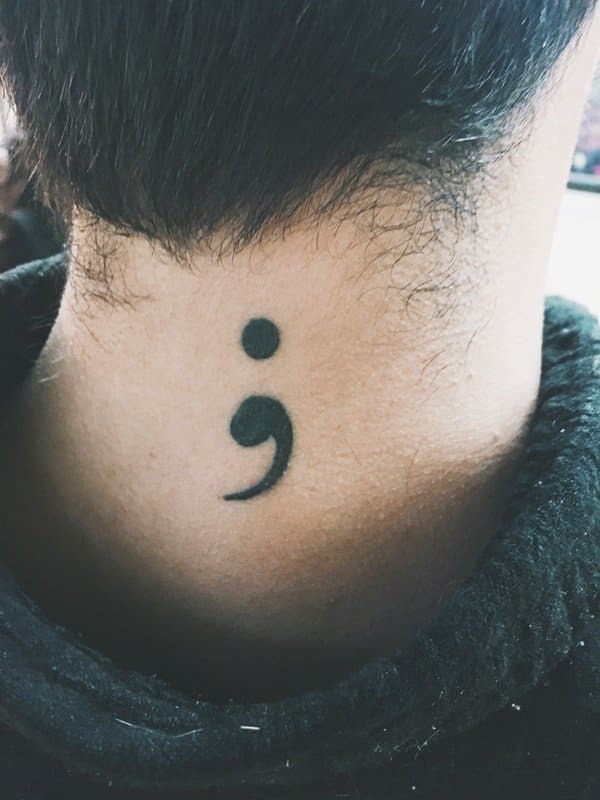 Of course, language experts know there is a little more to the semicolon’s usage than that, but the mark does serve the ideas of continuation well. 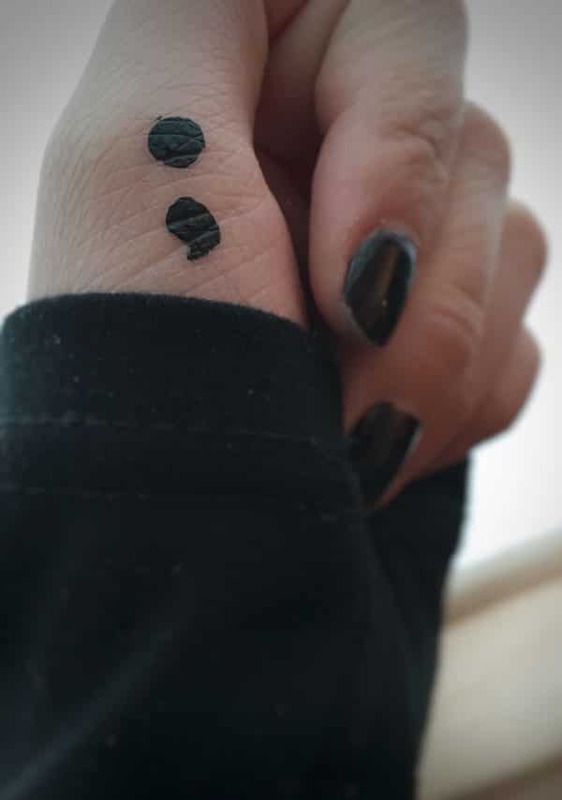 The semicolon has since come to stand as an image of support and membership in a community acknowledging the hurt that many people—especially the depressed—go through. 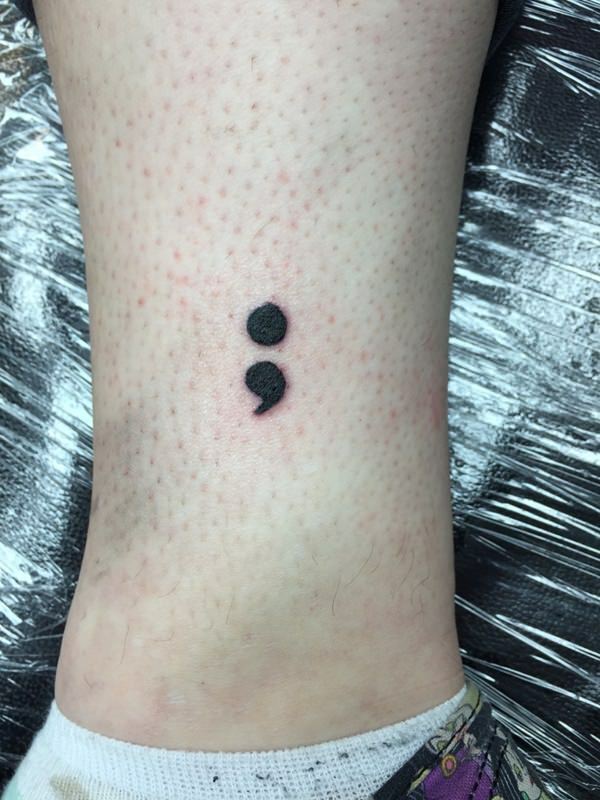 This signification explains many of the usual embellishment that goes with semicolon tattoos. 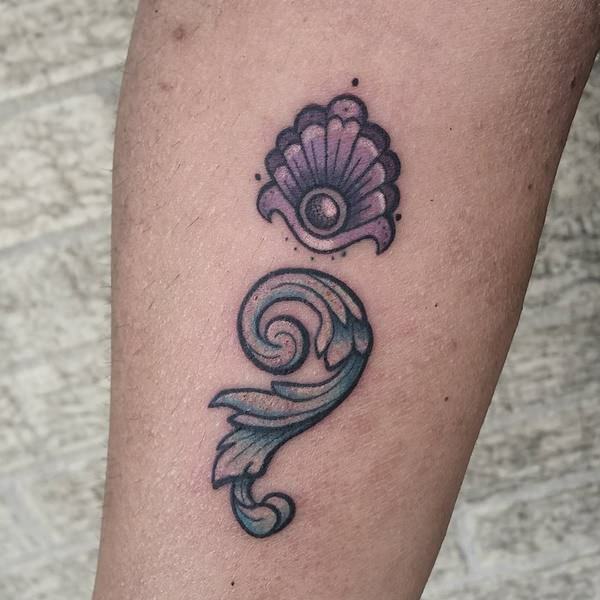 It is common to see them incorporated in designs with hearts or birds in flight. 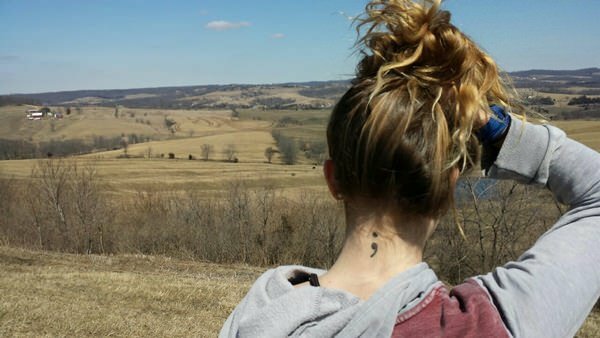 The formally usually suggests deep emotion while the latter hints at release or freedom (presumably, from hopelessness). 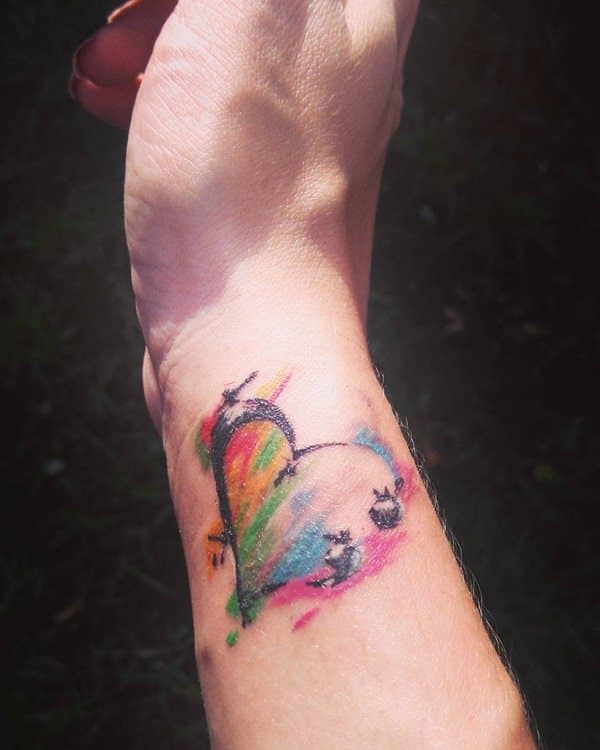 Many people also choose to have their tattoos rendered in a specific color or set of colors to further relate the message of hope to something personal: a lot of people get the tattoo in rainbow colors, for instance, because they below to the LGBT community. 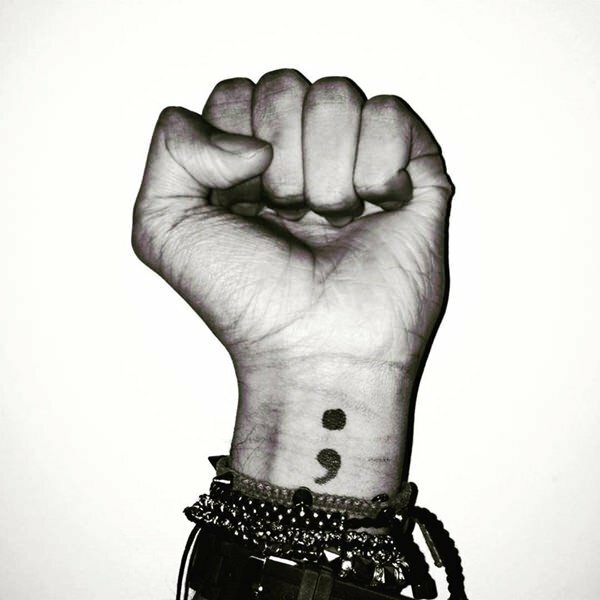 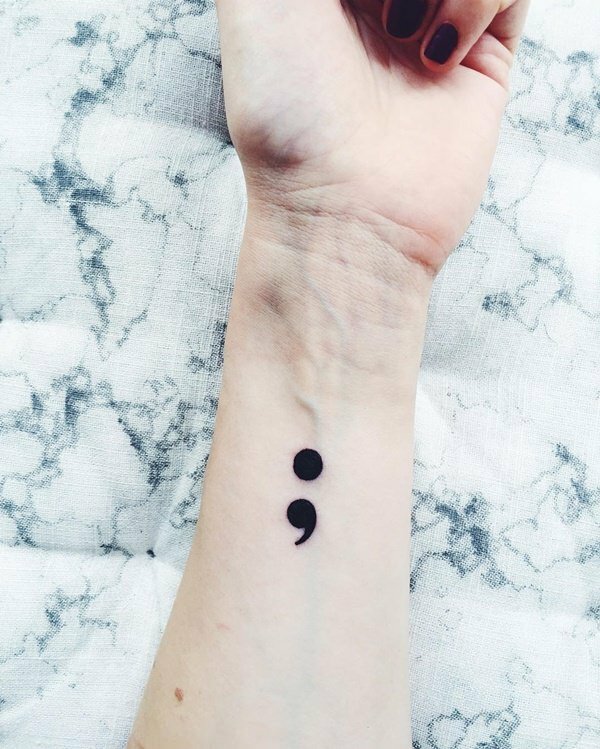 Simply because someone sports a semicolon tattoo does not mean they have considered or tried suicide in the past, however. 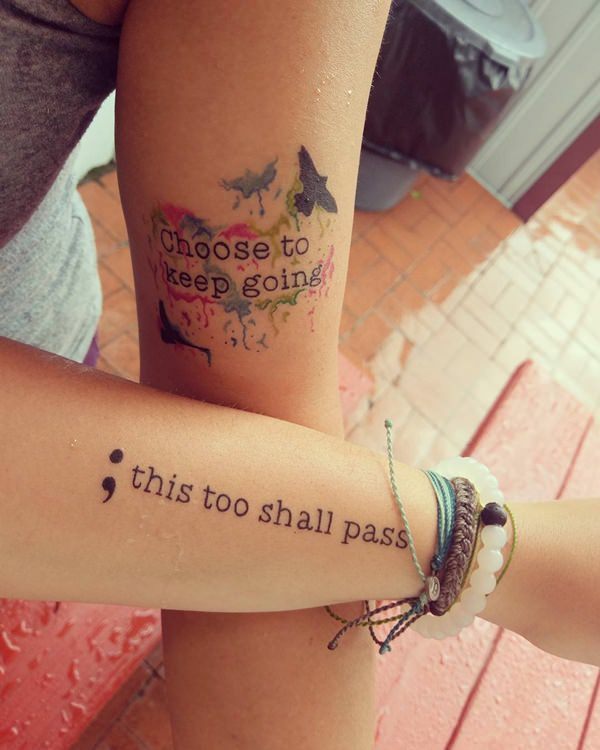 As we have already mentioned, the healing power of support is a big part of this advocacy. 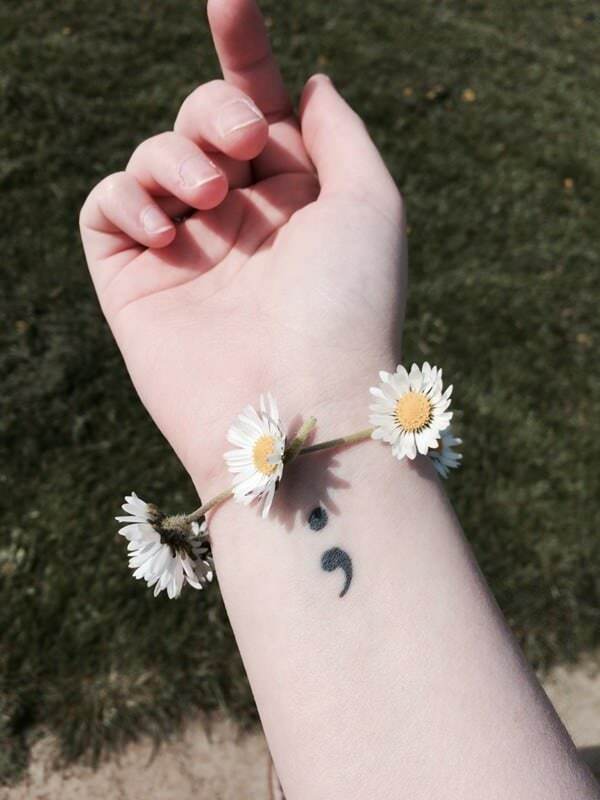 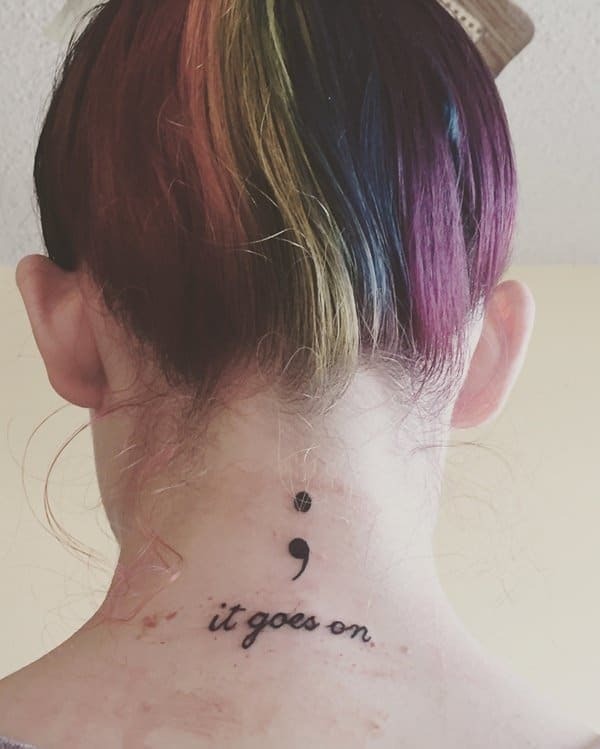 Many people get the semicolon tattoo not for themselves but for their friends, some of whom may have experienced depression or attempted suicide. 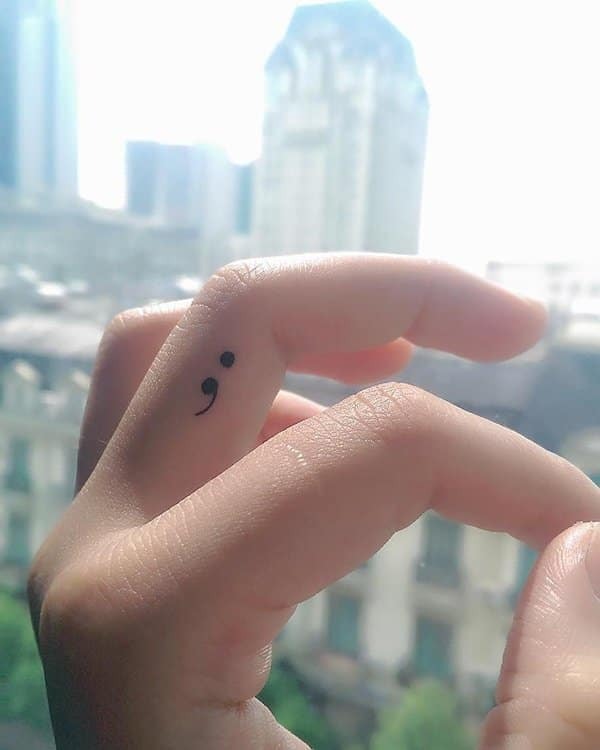 The beauty of the semicolon is that it is such a small, unobtrusive symbol that you can place it just about anywhere. 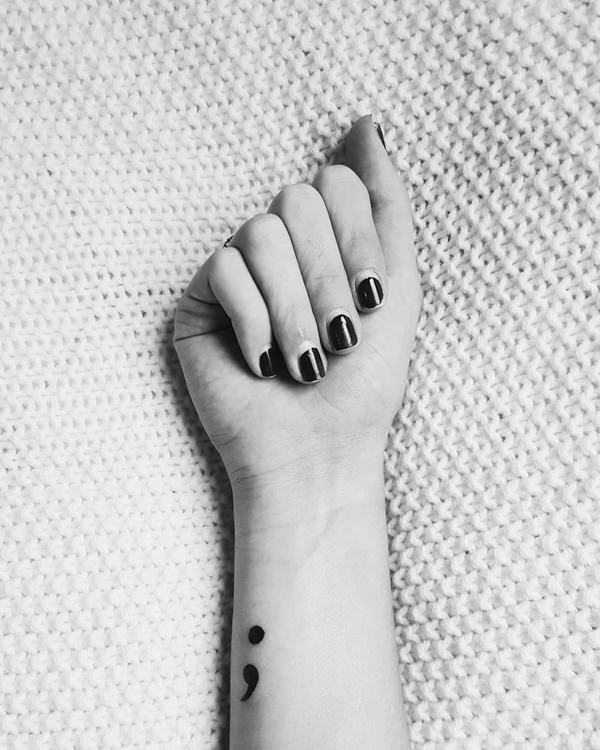 The very smallest ones can be placed almost in plain sight without being noticed all that easily: look at the examples where they have them tattooed on the skin behind the ear or on the side of a finger, for example. 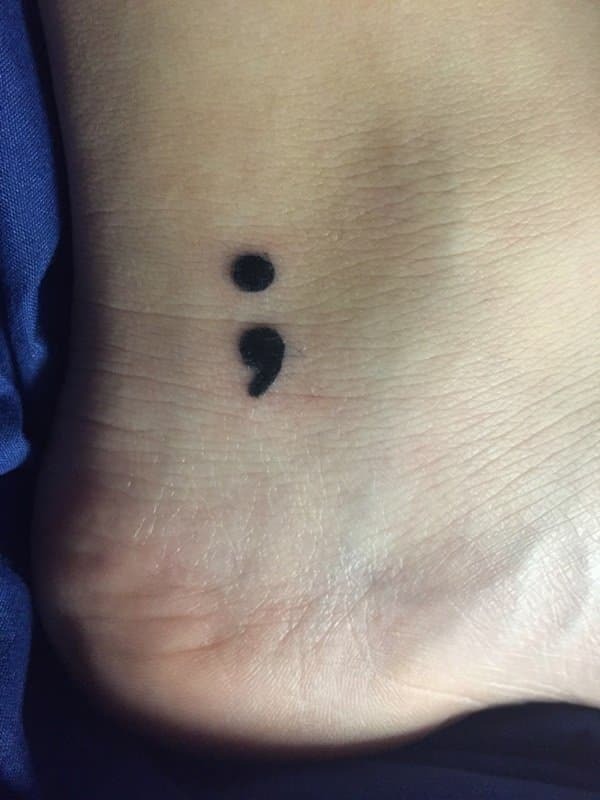 Some even get them tattooed on the very backs of their feet. 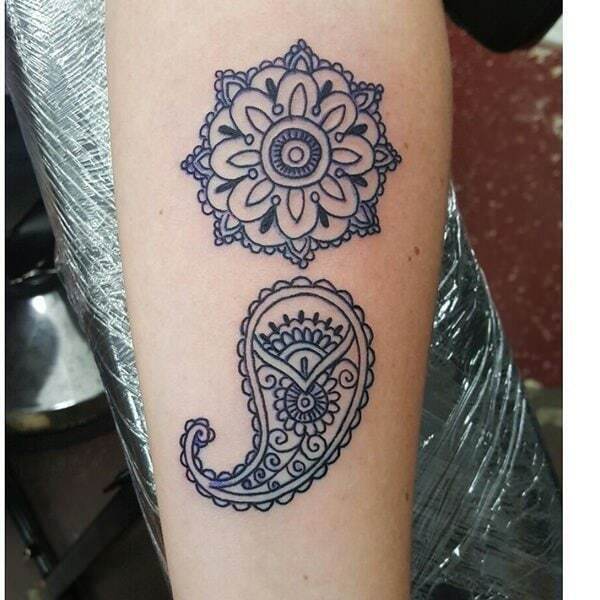 Larger designs and heavily ornamented ones usually get placed elsewhere, for obvious reasons. 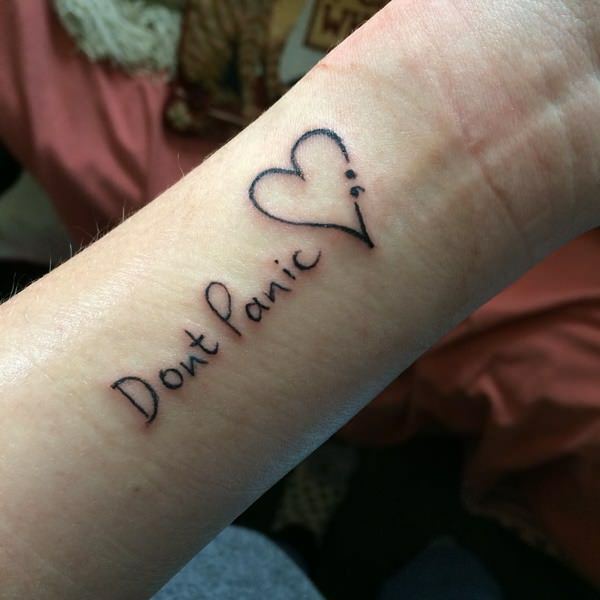 A popular place remains the inner forearm. 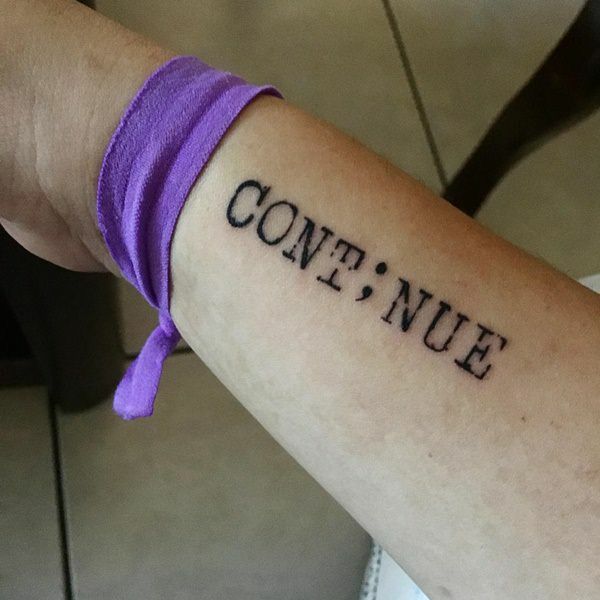 Some people get it there specifically as a reference and counter to the idea of wrist-slitting, even. 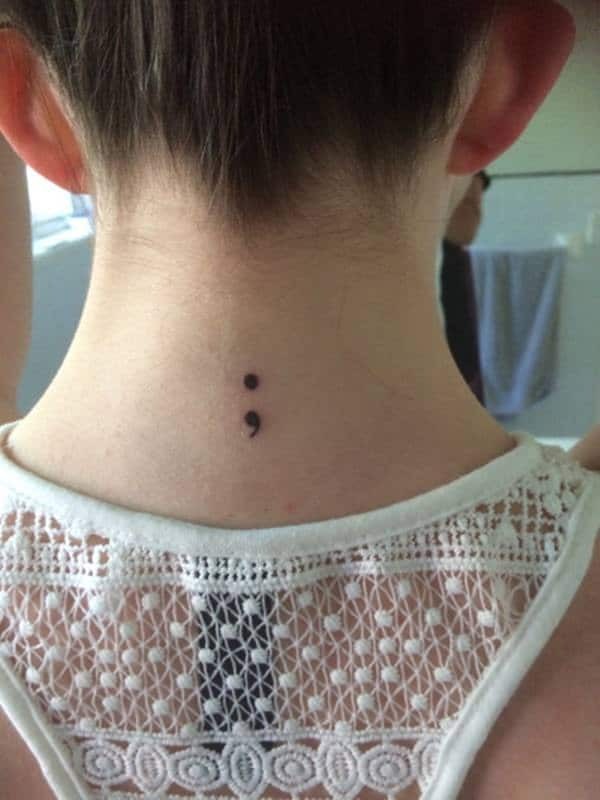 You can also get a semi-colon tattoo on the back of your neck, the side of your neck, on your thigh, and more. 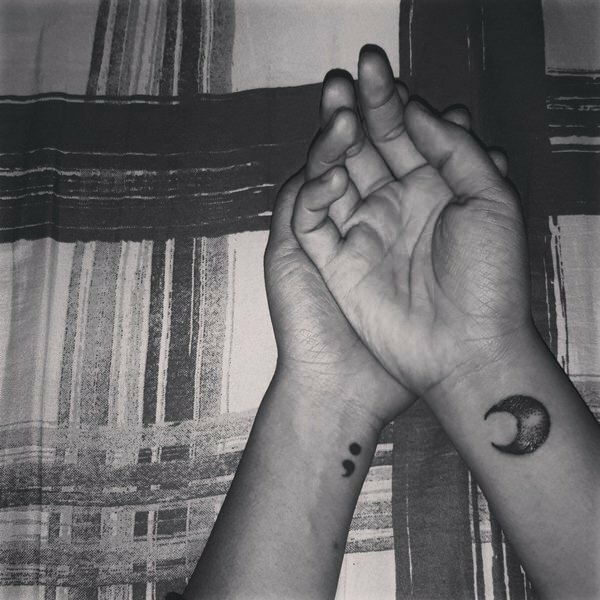 Before you go to your tattoo parlor, eat a balanced meal and make sure you drink enough to stay hydrated throughout the session. 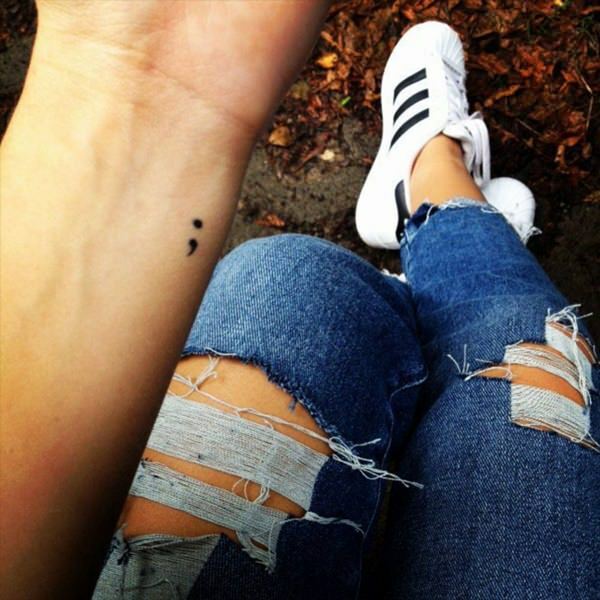 You may also want to choose clothes you can move aside or take off easily to give access to the tattooist. 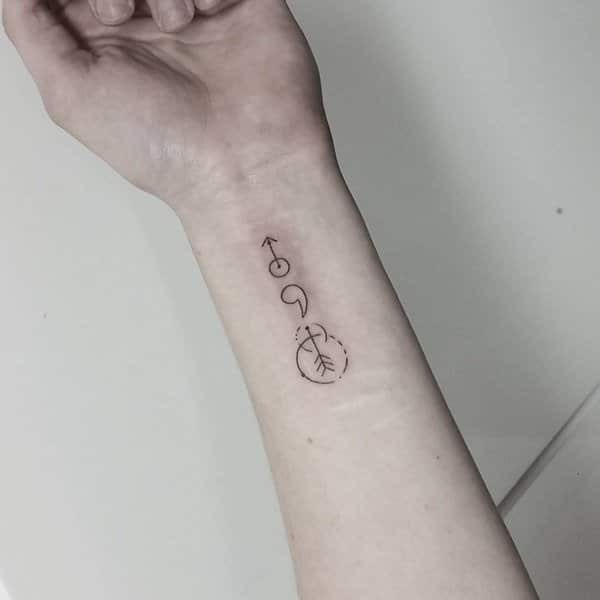 Think about bringing something that can pass the time as well. 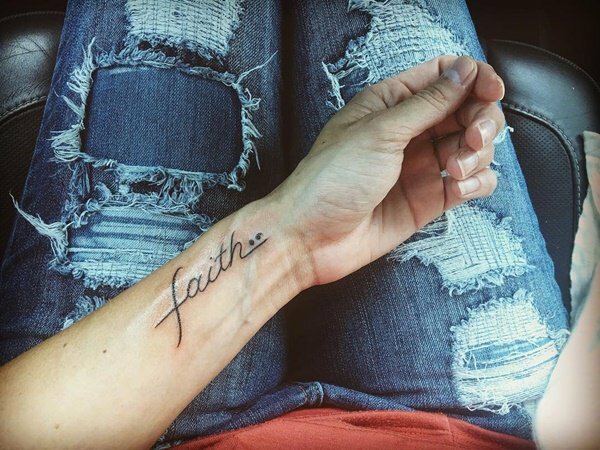 Most people bring MP3 players so that they can listen to their favorite tunes while waiting. 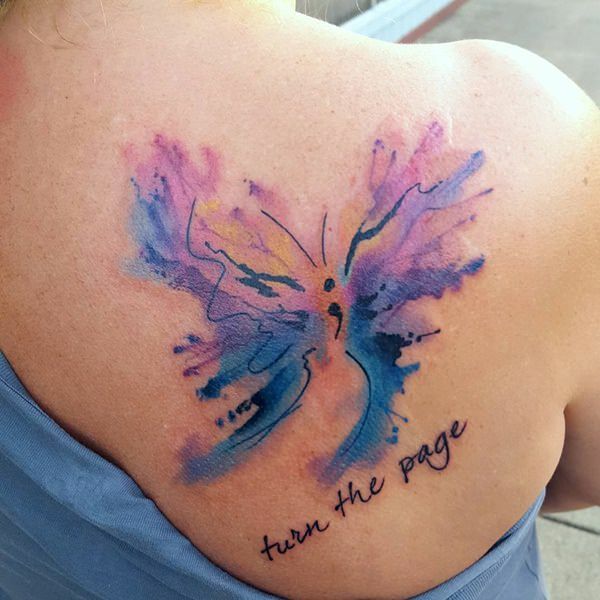 Others bring a book or just watch movies on their smartphones. 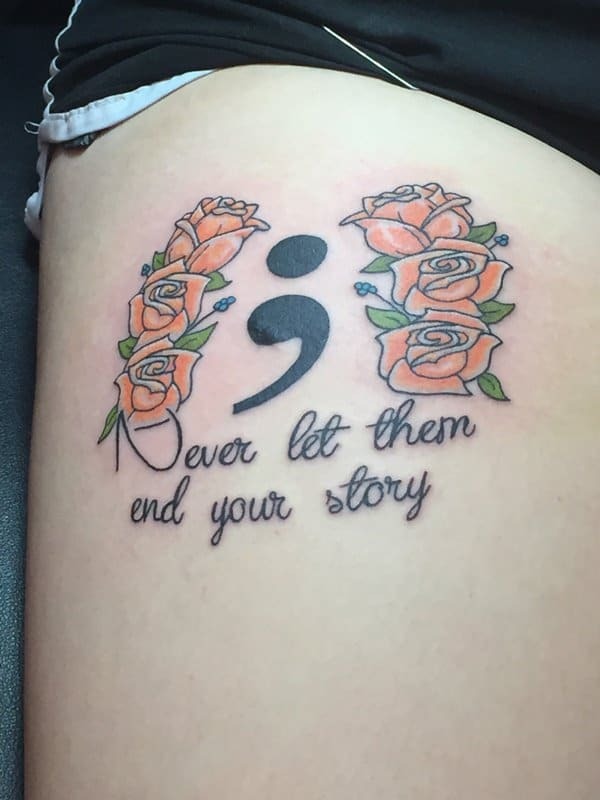 If you are on any medications or have any special medical conditions, you may want to tell the tattooist, by the way. 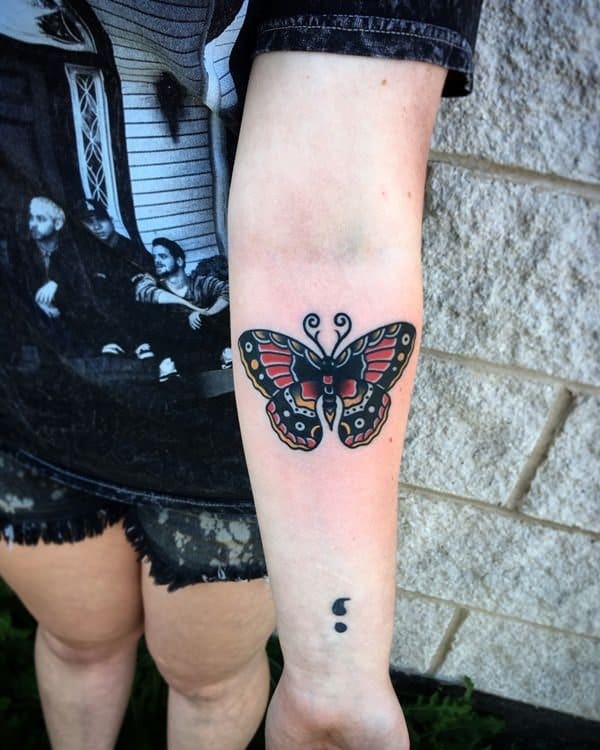 The general rule is to avoid tattooing if you are sick, to avoid putting too much stress on the body. 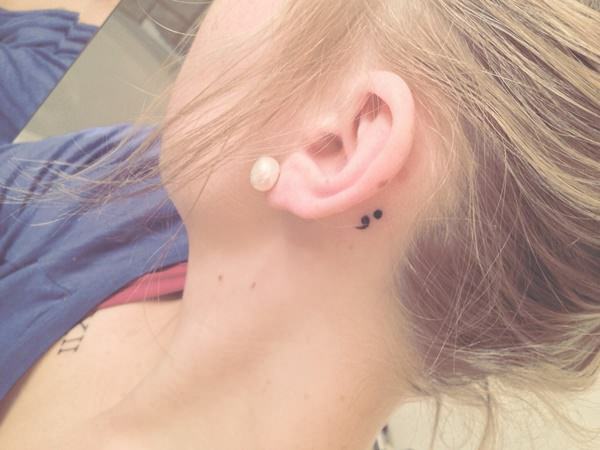 Semi-colon tattoos are some of the easiest to get, especially if you do not intend an embellished one. 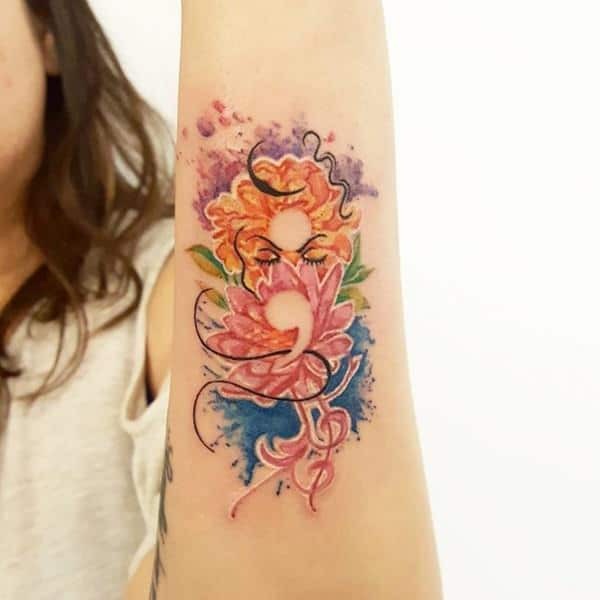 The cost is usually the very minimum for a tattoo, at least if you do not intend on something 2 inches in height or larger. 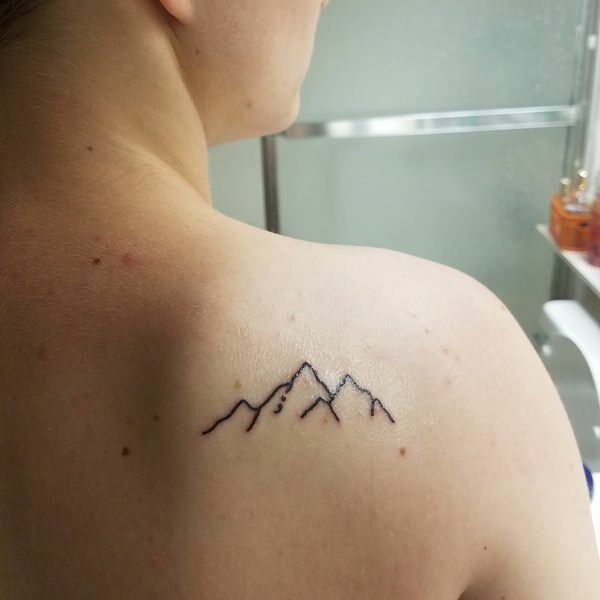 The smallest tats will run you about $40 or so, based on where you live. 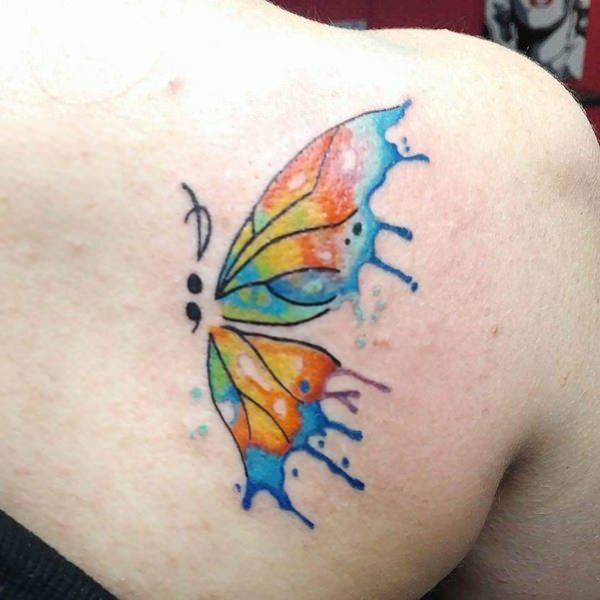 If you start adding special colors, designs, or even custom artwork to your tattoo, though, be prepared to pay more. 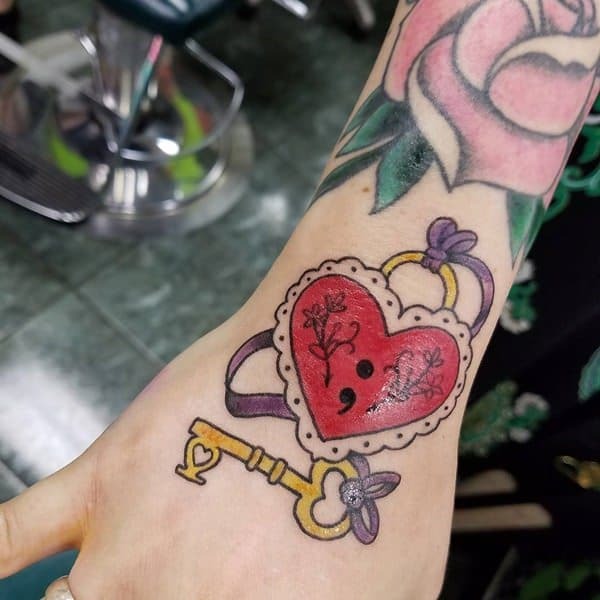 You can probably still stay within the hundred-dollar mark if you restrict yourself to the more modestly-sized options (no custom designs, though), but anything the size of a palm or more will probably get charged through a per-hour artist’s fee. 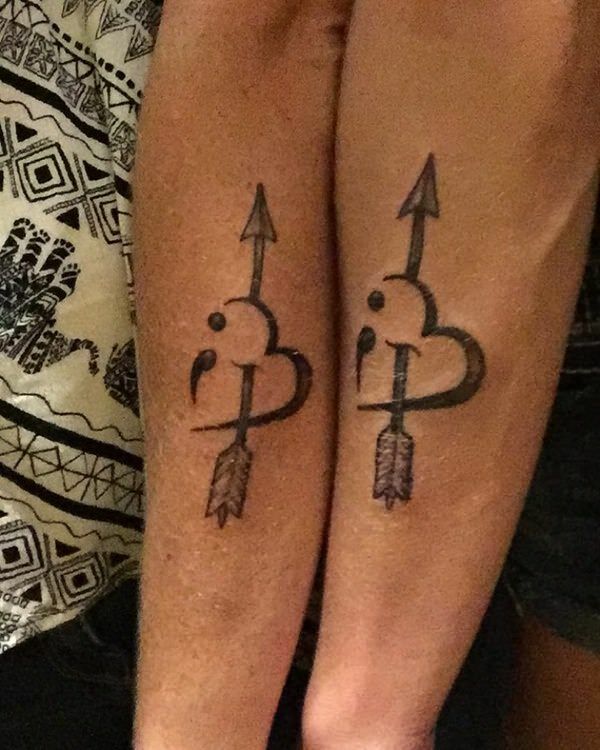 That can run anywhere from $100 to $200 per hour of work for the tattooist. 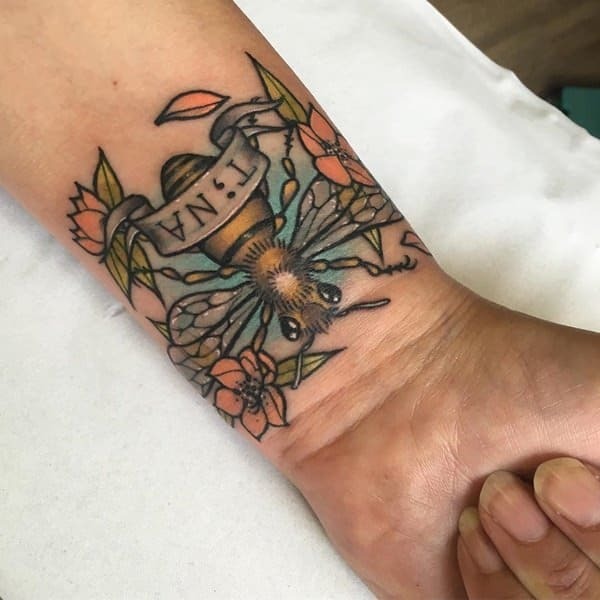 The pricier options are usually found in the big cities and tattoo shops, but do not hesitate to pay more even in other places if the artist’s work is worth it. 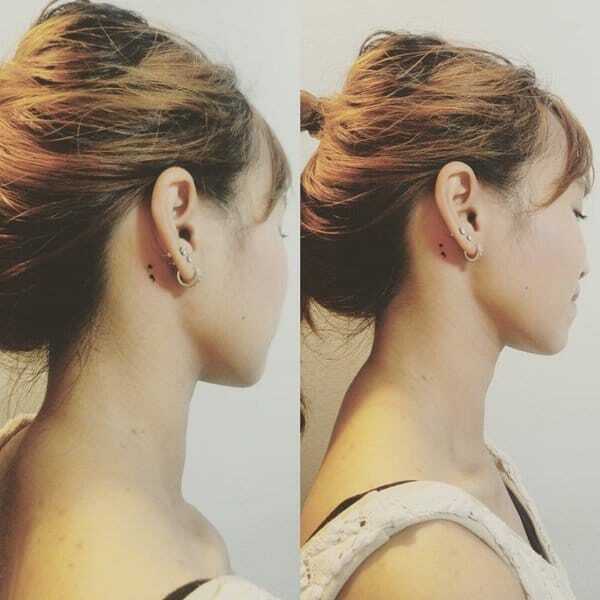 You can judge from samples of their previous work just how talented they are, after all. 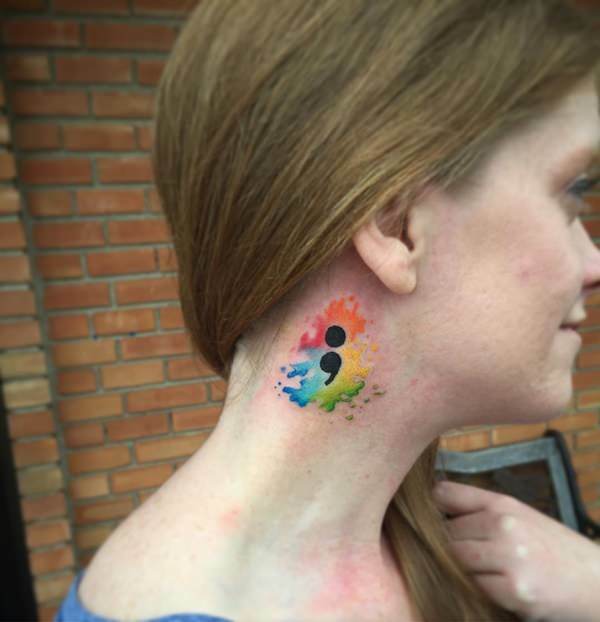 After you get your semicolon tattoo, keep it clean and dry as best you can. 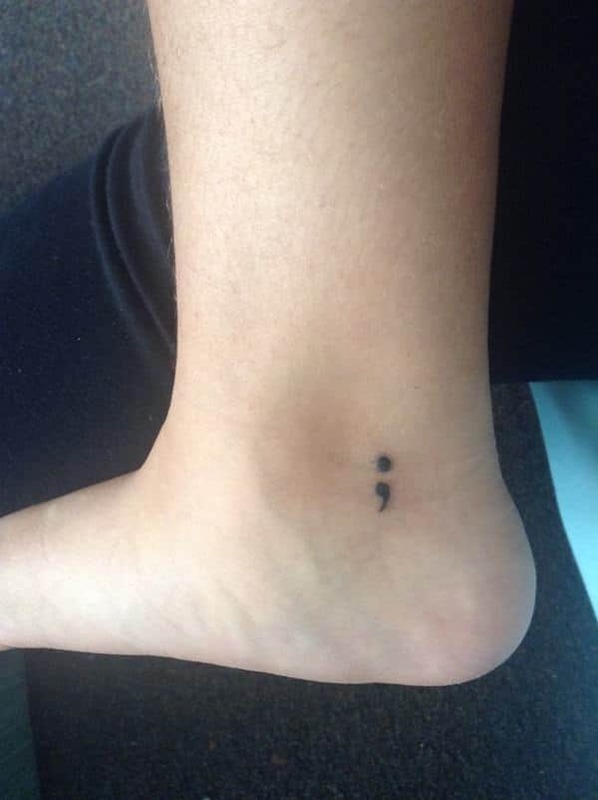 While washing is not prohibited, scrubbing is, since that can peel off scabs from the healing skin and even work germs into it. 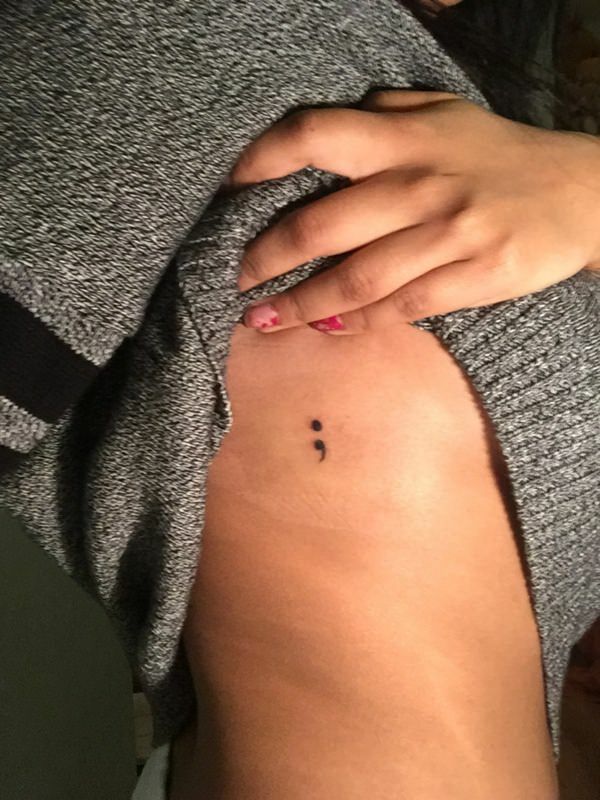 Vigorous rubbing of the area before the usual 2-week healing period can even dislodge tattoo ink. 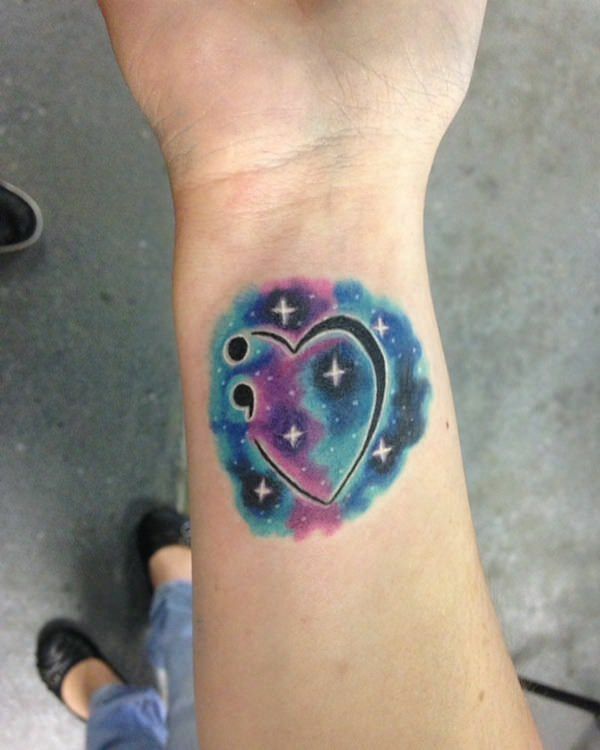 The result will be a patchy piece of body art that you will regret thoroughly. 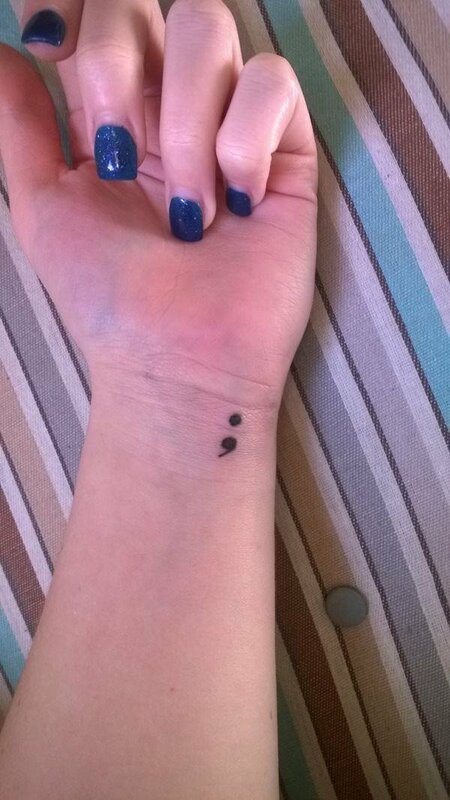 As such, try to avoid touching the tattooed skin as much as possible. 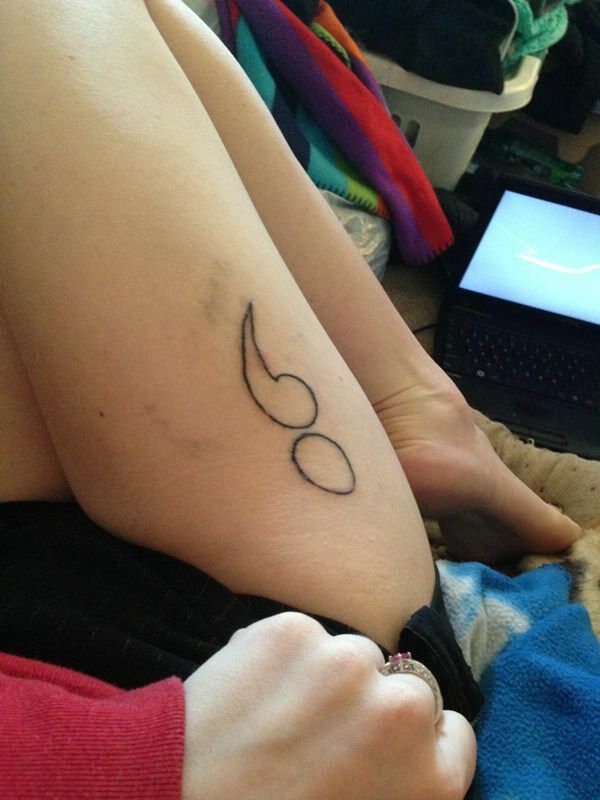 Another thing to remember about caring for the tattooed area is that you should only ever pat it dry. 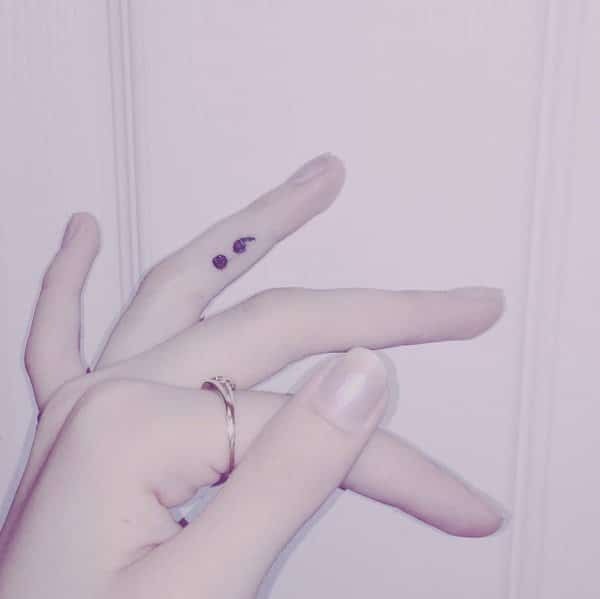 When you pat it, do it gently. 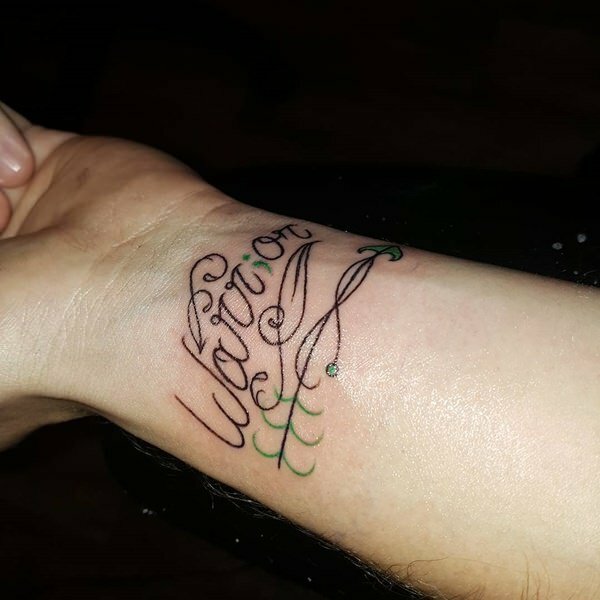 Make sure too that what you are using to dry it is clean. 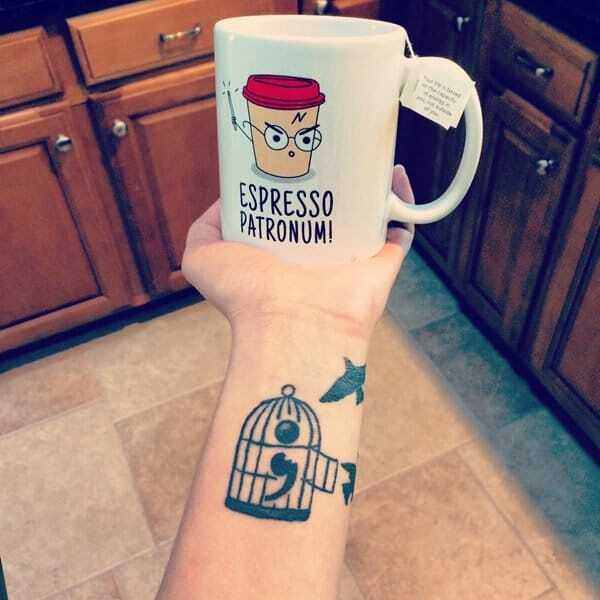 Otherwise, you might as well have rubbed germs into it instead. 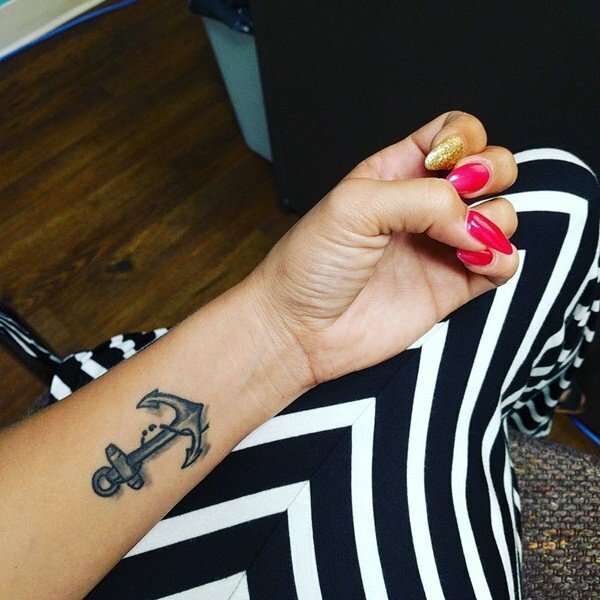 Some tattoo artists like to recommend ointments like Aquaphor. 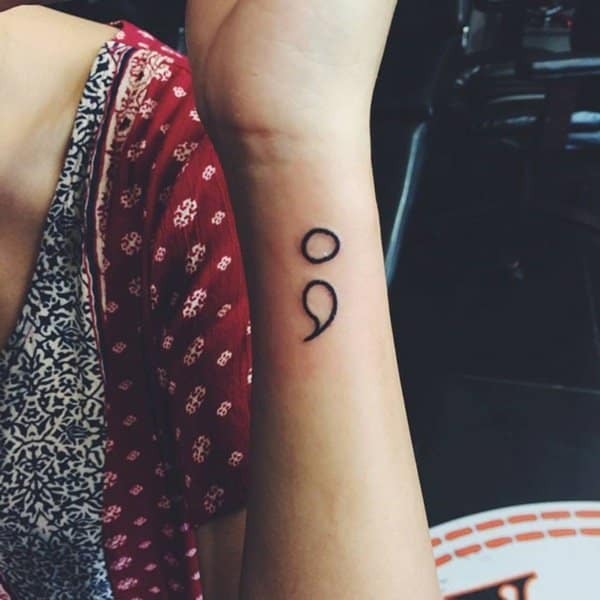 This is a healing preparation intended to help the recovery of dry, cracked, or scratched skin. 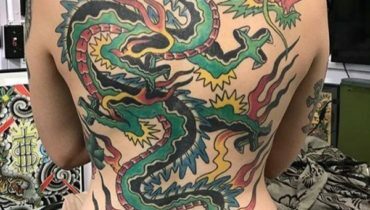 Since tattooing pierces the surface of the skin repeatedly, still-healing tattoos are basically still-raw wounds on your body. 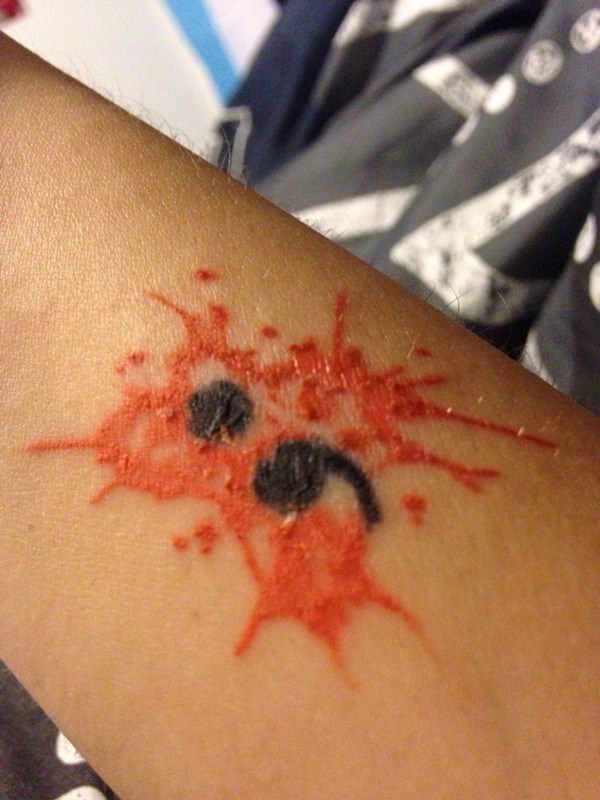 Thus, ointments like Aquaphor might not be a bad idea in that sense. 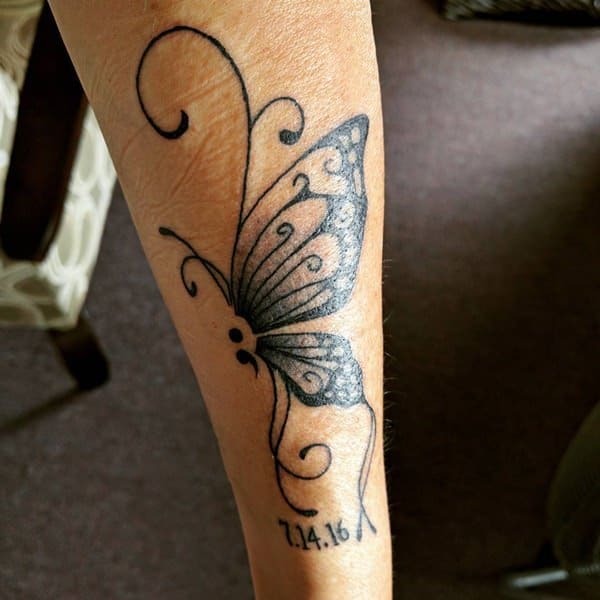 For more specific advice on how to care for your healing tattoo, you should talk to your tattooist. 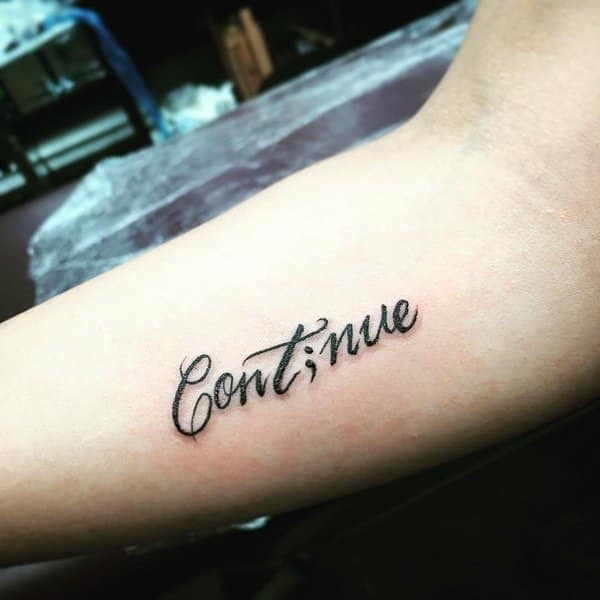 He can usually give you a timeline too so that you know when you should expect the tattoo to be healed. 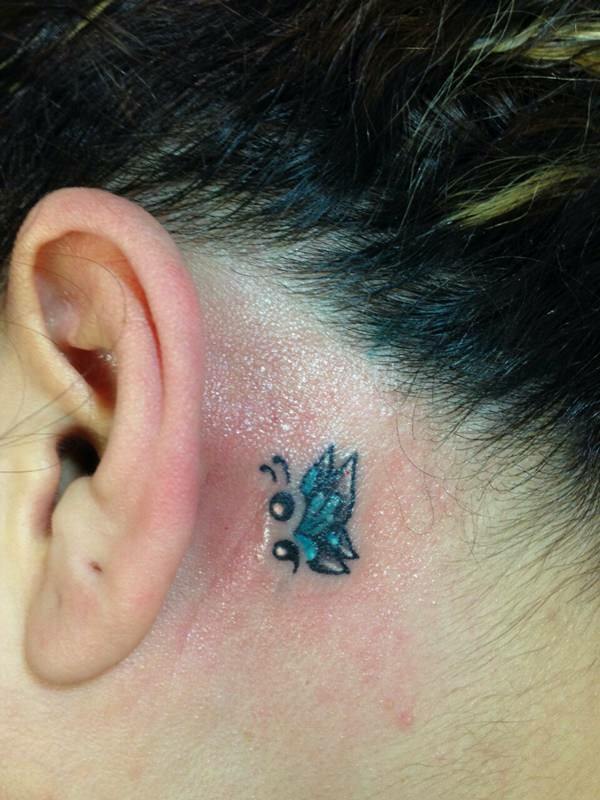 Keep in mind that you should take very good care of your tattoo the first few days after getting it. 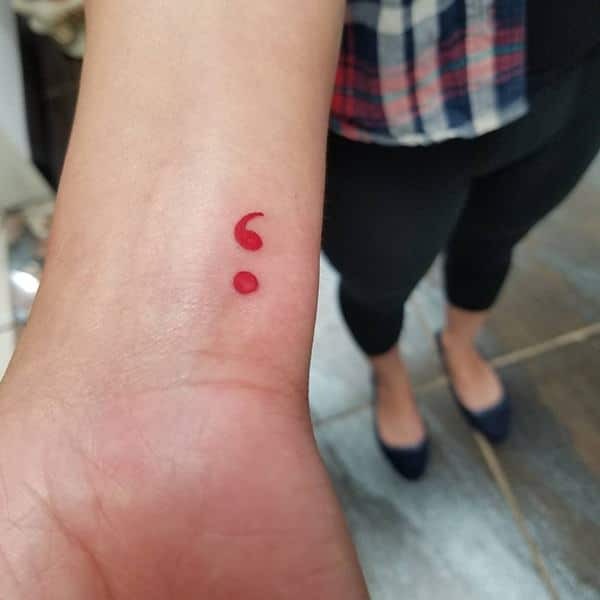 Follow the instructions above to the letter so that nothing goes wrong with its recovery. 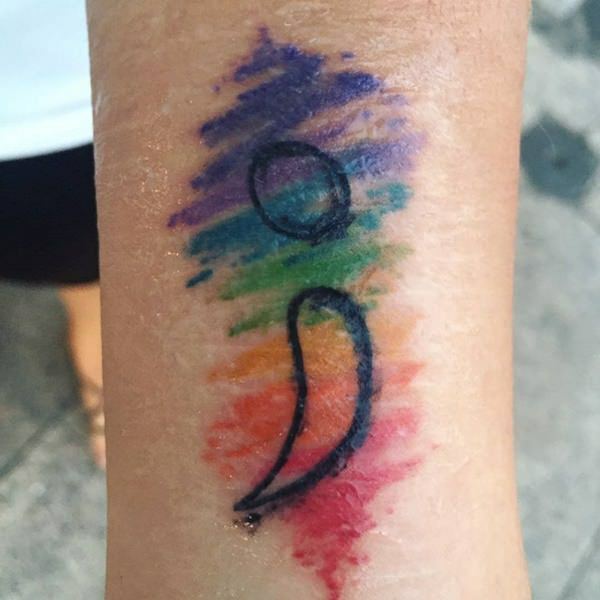 It would be the height of irony to get a tattoo supposed to stand for hope and healing only to have it tainted by an infection. 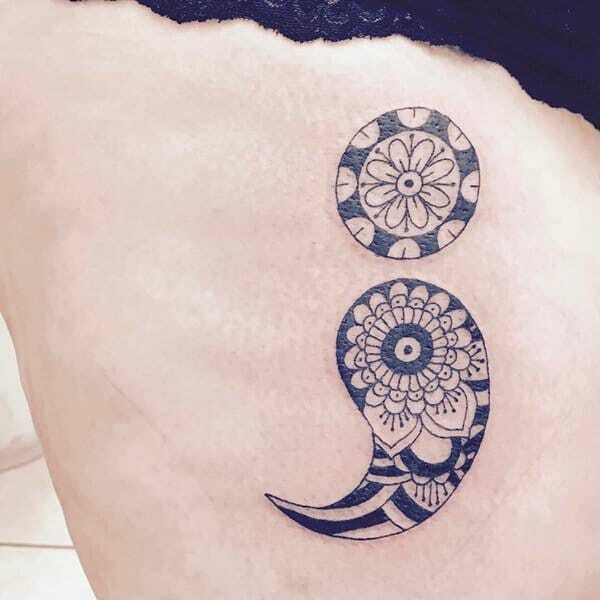 Care for it until it gets better and then you can flaunt it to everyone you like, to show your support of survivors everywhere. 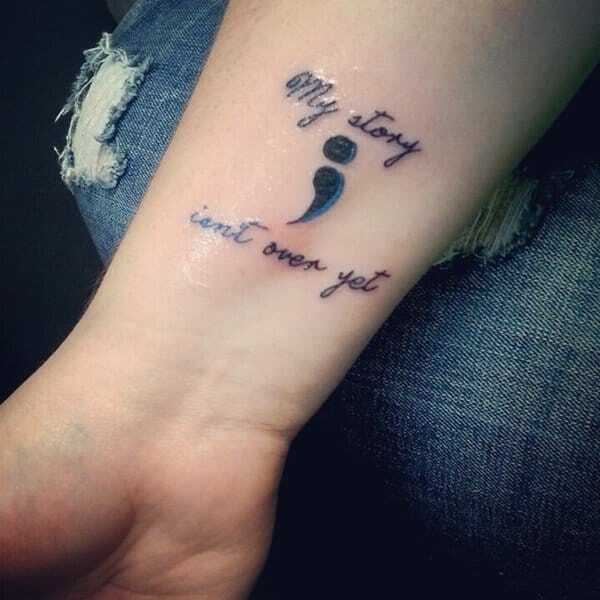 Most of us have at least one person in our lives whom we can support this way. 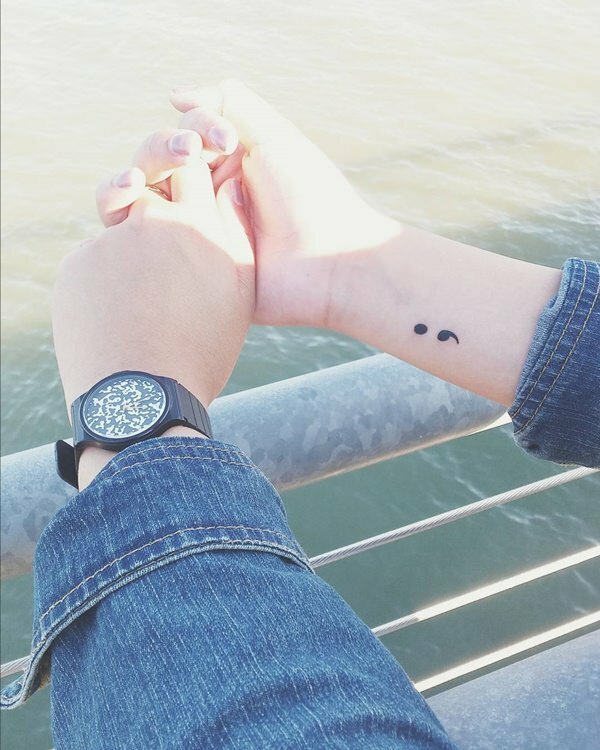 If you have one, tell us in the comments section below.